Earlier this week I wrote about potential changes to the Delta SkyMiles program that could potentially devalue how much SkyMiles are worth. In the newest news that go along with Delta’s plans to align benefits with the amount of money you spend, the airline has announced that it is introducing a new Basic Economy fare for domestic flights between Detroit and Orlando, Ft. Myers, Ft. Lauderdale and Tampa, and possibly (read: likely) to expand to other markets in the future. You can check out the complete fare rules on Delta’s website, but I thought I’d run through a few of the more salient ones below. The new fare, coded as “E” class of service, will be non-refundable (most non-refundable coach fares are able to be changed or cancelled with a $150 penalty), are combinable only with other E fares (meaning it’s all or nothing, so all segments must be E class, or no segments can be E class), and there will be no advanced seat assignments until time of check in, even for elite members/ Medallion members will be auto-assigned a seat at check-in, and if a Preferred Seat is available, they will get it. However, once assigned, you can’t make changes even for a fee! Way to crack the whip, Delta. While Medallions can’t pick seats, these fares are eligible for complimentary upgrades and the fare rules state that Same Day Standby and Same Day Confirmed will both be available. Passengers who purchase E class fares will still receive 100% base miles and MQM’s for miles flown, and elites will still earn their usual Medallion bonuses. Passengers who book Basic Economy will still be able to purchase extras like a WiFi pass, priority boarding, luggage, and the Mileage Booster. I priced out a sample itinerary late in April from DTW-MCO just to check out what happened, and sure enough the new E class came up in a third column of pricing titled “Basic Economy.” For this particular itinerary, it was a measly $12 cheaper. Frankly, I’d rather pay the extra few bucks and be assured of a seat assignment I liked. Though I completely understand there are scores of leisure travelers who don’t care (and won’t pick a seat anyway) and would rather have the extra cash in their pocket. You only save $12 on this fare from Detroit to Orlando. 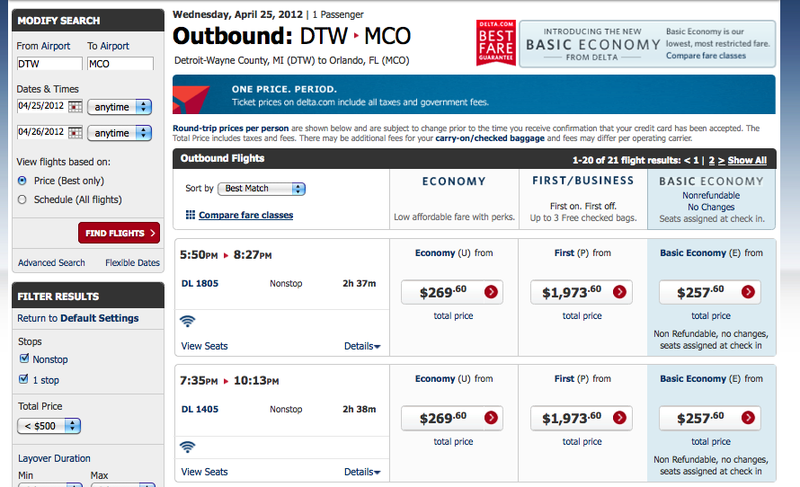 I like how Delta clearly separates these fares so people don’t accidentally book them. I think this could make them more competitive on ultra-leisure routes where price is everything. I do however think this is a pre-cursor of more things to come and my hope is that they don’t erode the value of Medallion status or how SkyMiles can be redeemed. More to come, but I’ll be covering these developments as they arise!